Thinking of learning tennis, want to ‘brush up’ your skills, or desperate to beat your mate? Based in East London? Then you need some Fab Coaching! 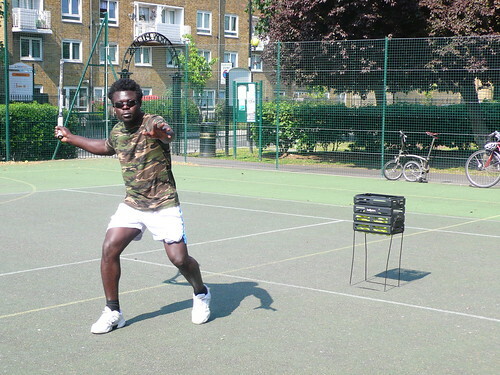 Fabian Awah Kum offers one-on-one tennis coaching, or why not join one of his group sessions? Fabian teaches children, men and women of all ages and levels, and also runs tennis lessons for a local school. He is LTA licensed and is based in London Fields, Hackney. For those who want to practice match play, Fabian organises an East London tennis league. Results tables are published in the News and Events section. A charismatic former professional footballer, Fabian is an inspiration to young players and great fun to learn with.